When it comes to cybersecurity legislation, you shouldn’t mess with Texas. 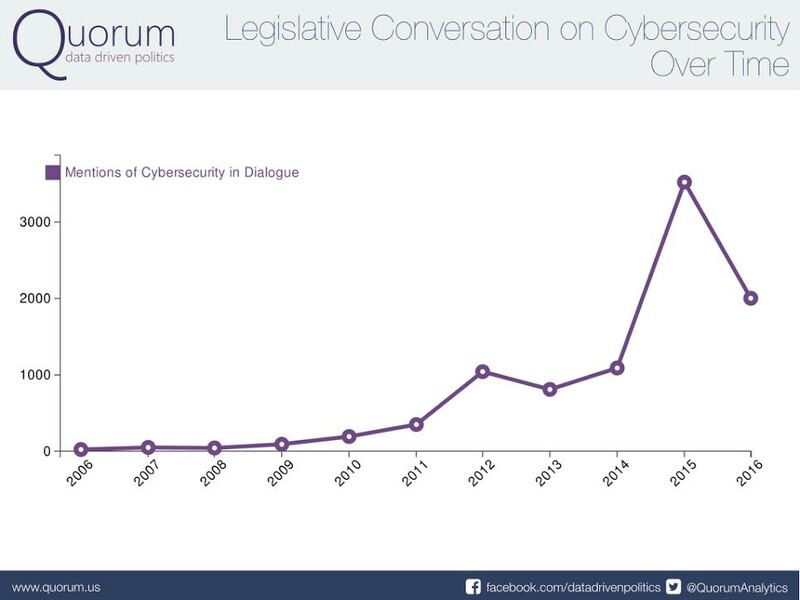 New data shows that the state’s federal representatives have introduced the lion’s share of cybersecurity legislation in this Congress. The 114th Congress’ lead man on cybersecurity legislation is Rep. Michael McCaul, R-Texas. The boisterous Dallas native, known for his leadership as chairman of the House Homeland Security Committee, has helped introduce a total of 17 cybersecurity-focused bills since 2015, more than any other legislator. Of the 17 bills introduced — excluding resolutions and amendments — five have yet to be enacted and 12 are cosponsored by McCaul. Only two cybersecurity-related bills introduced by the 114th Congress have become law: the Homeland Security Appropriations Act and Gerardo Hernandez Airport Security Act of 2015 — neither of which are particularly focused on the advancement of digital security. While the appropriations act is more of broad based funding approval mechanism, the latter only mentions cybersecurity in the context of conducting security reviews on “interoperable communications” used at domestic airports. Even so, a small but influential group of Texas republicans are seemingly making it their mission to crank cybersecurity-related legislation into the partisan meat grinder that Washington’s lower chamber has become. Over the last 10 months, McCaul has been behind the introduction of new cybersecurity bills, including the Taking Responsibility Using Secured Technologies Act of 2016, Cybersecurity and Infrastructure Protection Agency Act of 2016 and Digital Security Commission Act of 2016. Each of these bills would have an objectively significant impact on the way America approaches cybersecurity at large. 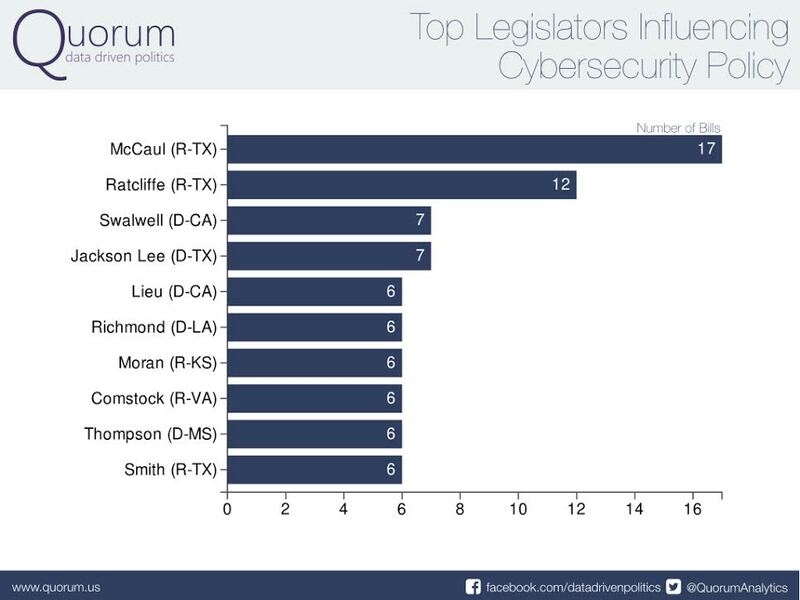 Serving as chairman of the House Homeland Security’s Subcommittee on Cybersecurity, Ratcliffe was second only to McCaul in his efforts to introduce cybersecurity-related legislation this session with a total of 12 cyber bills, according to data gathered by political data analytics firm Quorum. Ratcliffe has sponsored bills — independent from McCaul’s own efforts — that could one day potentially further cybersecurity-centric federal research, unilateral defenses, classified information protections, sanctions on Iran and to develop related foreign alliances. The recent passage, for instance, of Ratcliffe’s Strengthening State and Local Cyber Crime Fighting Act in the House could one day drastically change how DHS conducts cyber investigations through the creation of a “National Computer Forensics Institute” operated by the U.S. Secret Service. 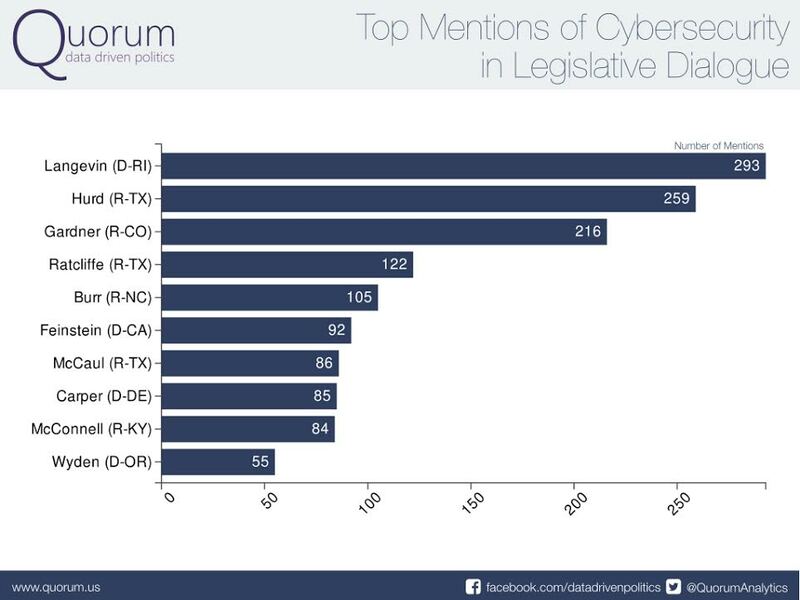 As a group, McCaul and Ratcliffe along with fellow Rep. Will Hurd, a former undercover CIA agent, have also talked about cybersecurity the most in comparison to other lawmakers, according to data provided to CyberScoop by Quorum, analyzed by scraping language used on Twitter, Facebook, official congressional press releases and floor statements. “Chairman McCaul and others on the Homeland Security Committee recognize what all of our enemies also know – that cybersecurity is intricately linked with our national security. It’s exciting to serve on a committee that is taking the lead on this important issue,” said Hurd. Beyond the Republican-held Homeland Security Committee, McCaul is a member of the Committees on Foreign Affairs and Science and Technology; which are becoming independently aware of cybersecurity influences that increasingly impact their own policy interests. Under the six-term Congressman’s watch, the Homeland Security Committee has passed a total of 84 bills through the House, with another 18 reaching President Barack Obama’s desk for signature. Outside of the House, McCaul is the coauthor of a proposed encryption working group that looks to bring together experts from academia, the U.S. intelligence and defense communities, privacy advocates and Congress for a discussion on the viability of potential regulatory policy. The encryption working group received a significant show of support from democratic presidential candidate Hillary Clinton earlier this year. It is believed that lawmakers will once engage in a robust debate focused on encryption policy early next year, once the dust settles from November’s presidential election. Security experts widely believe that Washington’s ability to craft effective cyber policy cannot keep pace with today’s changing threat landscape imposed by hackers. Around Washington, amid a call for relevant policy solutions, McCaul has become a popular spokesperson for cybersecurity initiatives. Last month, he sat down with U.S. Chamber of Commerce Senior Vice President Jack Howard for a 30 minute fireside chat about the U.S.’ cybersecurity posture. Months prior, at another event hosted by George Washington University, McCaul spoke more broadly about threats to national security, including those posed by hackers. He is a common face on cable news networks like CNN, Fox News and ABC. McCaul for all his leadership on the issue, however, has not been without his cybersecurity-related gaffes. Appearing on CNN’s “The Situation Room” with Wolf Blitzer, McCaul shocked many when he said that the Republican National Committee’s had been hacked in similar fashion to the DNC. Top RNC officials immediately disputed McCaul’s claim. And shortly after the interview, McCaul walked back his comments, claiming he misspoke. Following the aforementioned Chamber of Commerce event in September, McCaul told a small group of reporters that he believed recent statements regarding Russian hacking made by democratic intelligence committee leaders Reps. Dianne Feinstein, D-Calif., and Adam Schiff, D-Calif. were politically motivated. Shortly thereafter, the Obama administration publicly accused Russian intelligence for meddling in the American political process. On Wednesday, a letter signed and distributed by a group of Republican lawmakers, former U.S. officials and defense experts — which included McCaul’s signature — endorsed Republican presidential nominee Donald Trump’s national security plan that largely focuses on increased defense spending. It’s not the first time McCaul has endorsed Trump’s ideas, though the reality star-turned candidate has repeatedly ignored the veteran congressman’s guidance.